Relay 1 was principally a communications satellite. Included in its payload were radiation experiments designed to map the earth's radiation belts. The spin-stabilized spacecraft had an initial spin rate of 167.3 rpm and an initial spin axis orientation with a declination of -68.3 deg and a right ascension of -56 deg. Shortly after launch, two basic problems evolved. One was the satellite's response to spurious commands, and the other was the leakage of a high-power regulator. This leakage caused the first 2 weeks of satellite operation to be useless. After this period, satellite operation returned to normal. The satellite carried one transmitter for tracking and one for telemetry. The telemetry system was PCM at 1152 bps. Each 128 words per telemetry frame (of 1 s duration) used 113 words for the particle experiment. The leakage problem caused the spacecraft to revert to a low voltage state early in 1965. Sporadic transmission occurred until 10 February 1965, after which no usable scientific data were obtained. 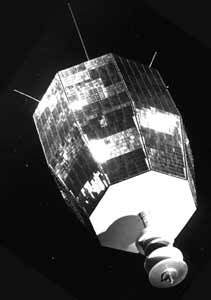 Relay 2, although principally a communications satellite, carried particle experiments designed to map the trapped radiation belt. The spin axis orientation had a right ascension of about 130 deg and a declination of about -60 deg. Accurate spin axis orientation information was not available. The initial spin rate was about 173 rpm. Relay 2, physically similar to Relay 1, had on board two transmitters, one of which was used for PCM telemetry (the sequence requiring about 1 s). Design changes in this satellite improved its performance to the point where response to spurious commands was essentially eliminated. One of the two onboard transponders operated normally until 20 November 1966. From that time until its failure on 20 January 1967, it required a longer time than normal to come on. The other transponder continued to operate until 9 June 1967, when it too failed to operate normally.